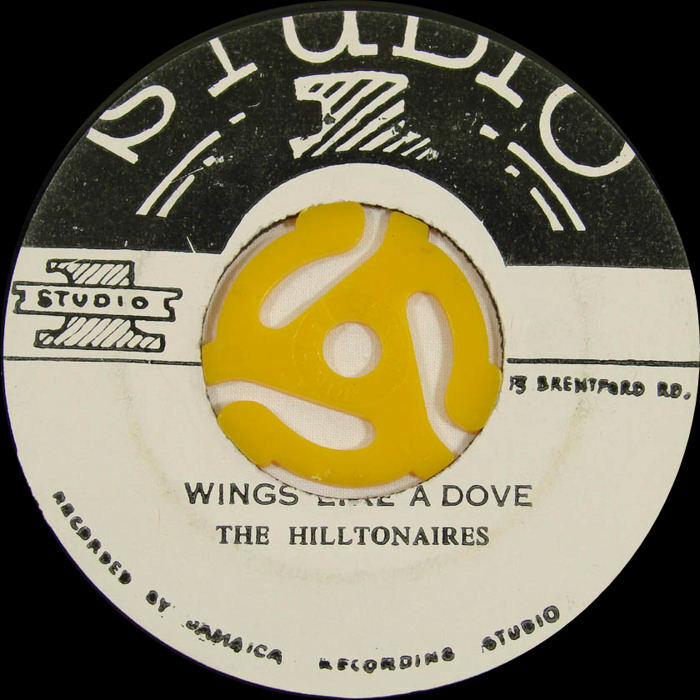 The Hiltonaires were named for Kingston's Hilton Hotel, where they were the house band. 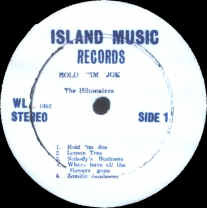 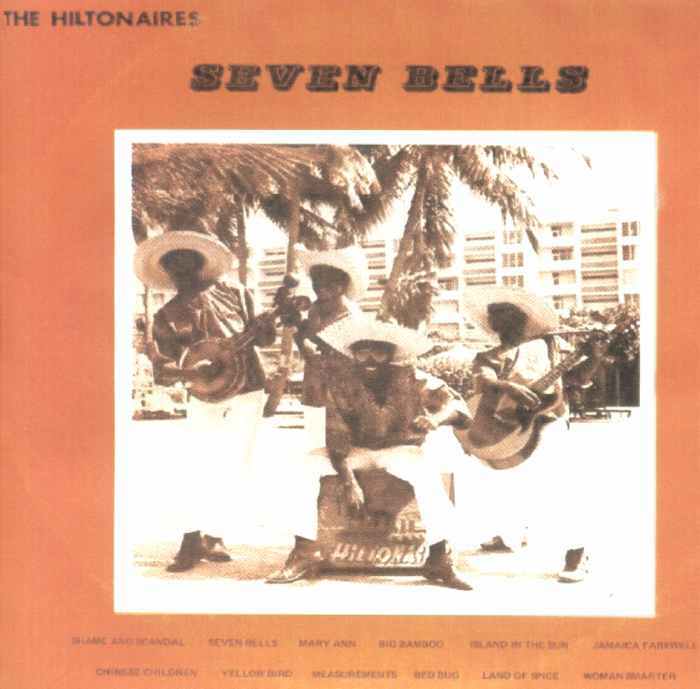 Though not necessarily the best mento group ever recorded, The Hiltonaires may have been the most prolific, recording six LPs during mento's middle period. They also toured North America, playing such cities as Miami, New Orleans, Atlanta, Dallas and Houston, as well as destinations in Canada. 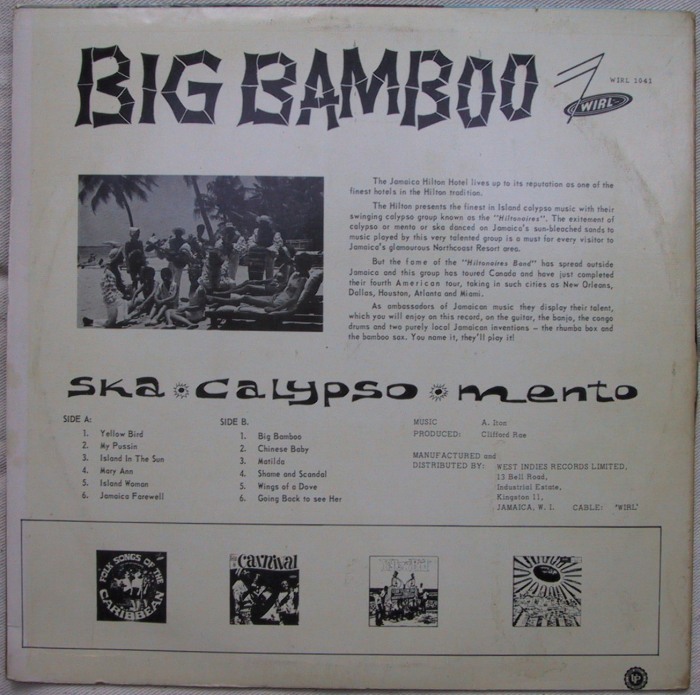 are popular selections from the mento repertoire. 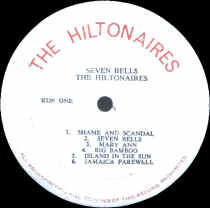 Many appear on more than one Hiltonaires LP, though they are different renditions. 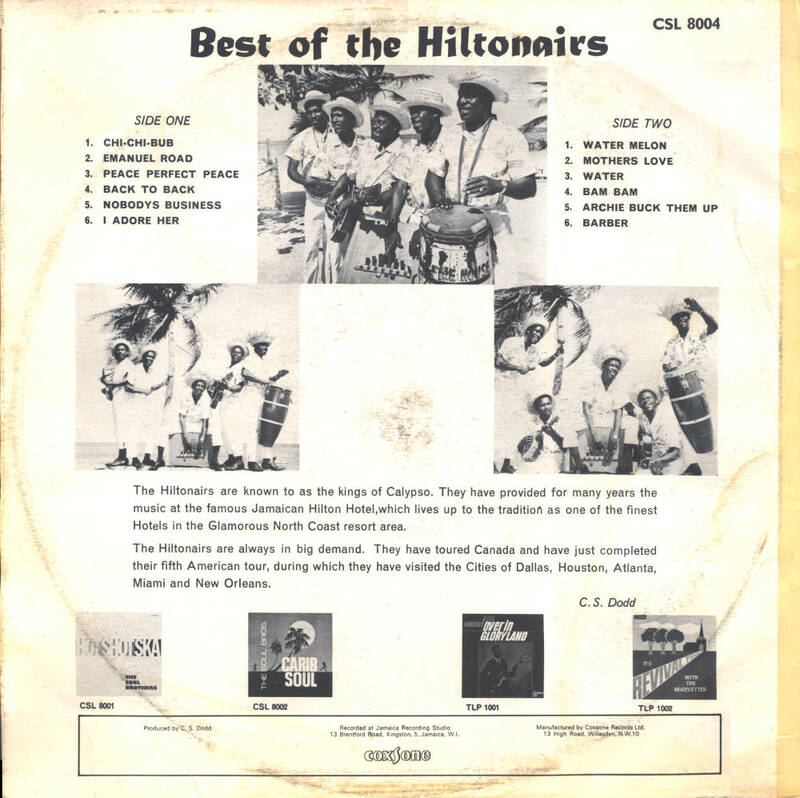 The Hiltonaires utilized a number of lead singers across these LPs, including one un-credited lead singer mento and reggae fans already know. 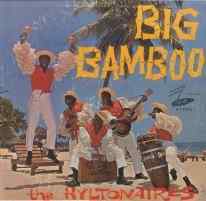 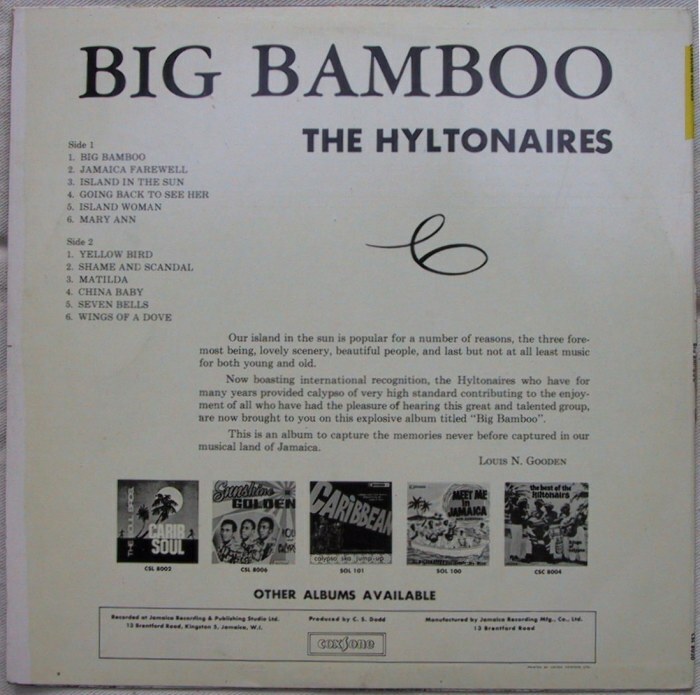 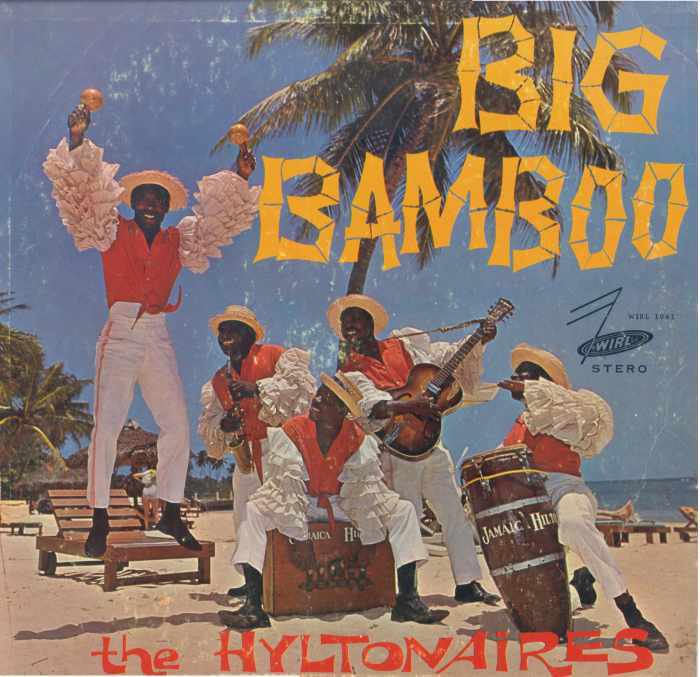 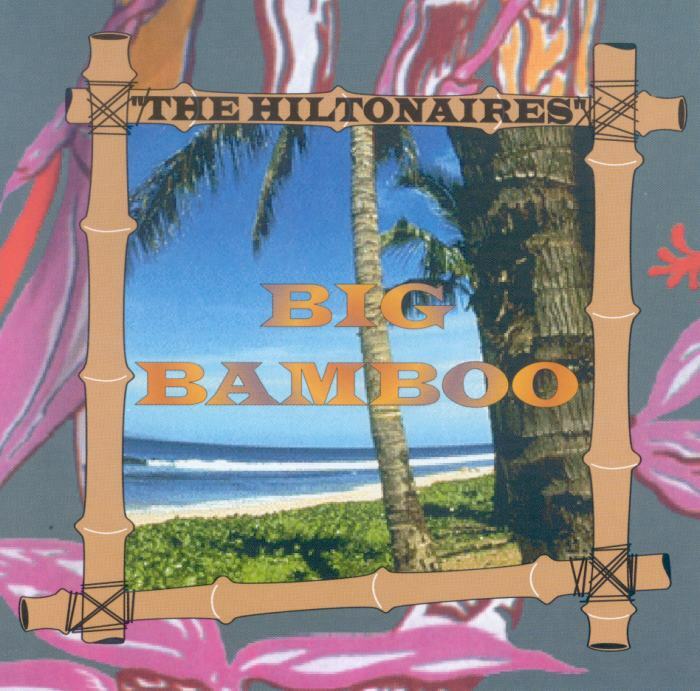 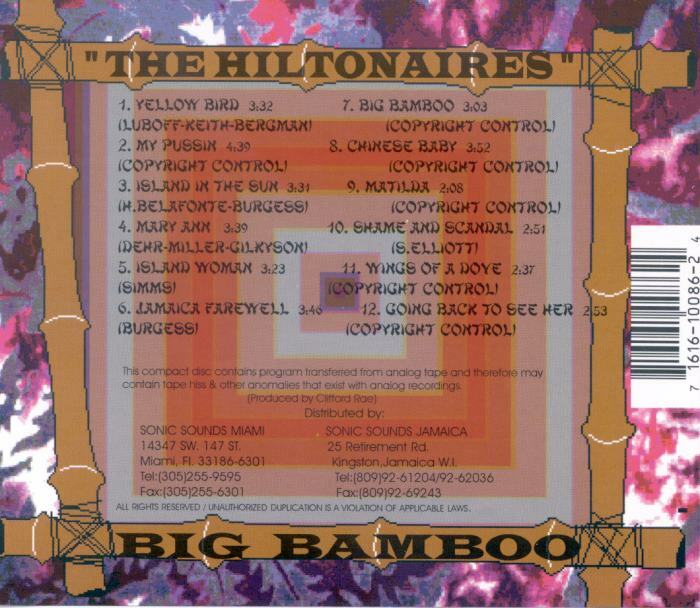 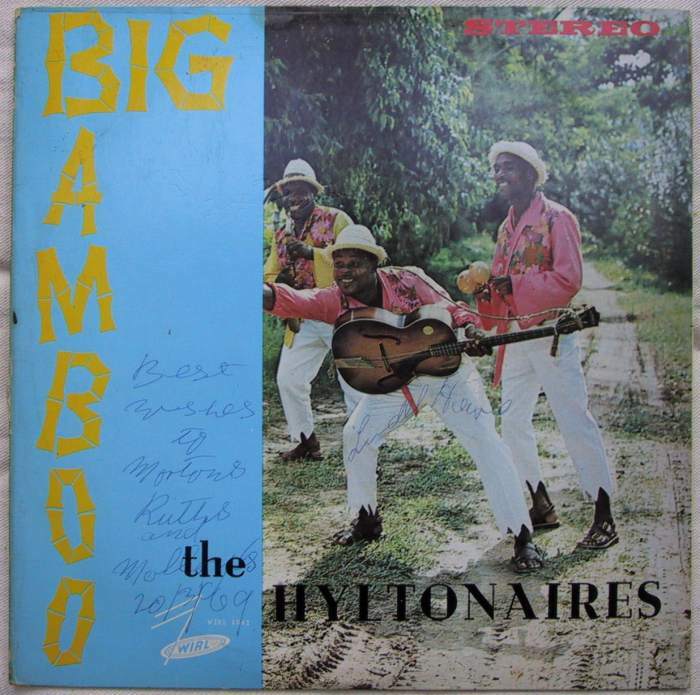 Lawrence Christie - Rumba box "and is also a useful vocalist"
"Big Bamboo" is The Hiltonaires' most popular LP. 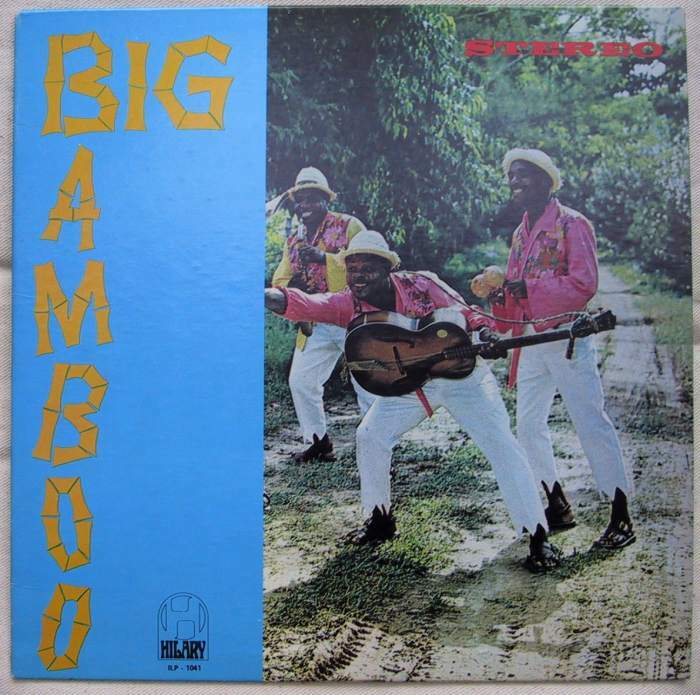 It features classic rural instrumentation, including what sounds like a bamboo saxophone (though only a regular sax is ever pictured on an LP jacket) and sometimes augmented with a little electric guitar. 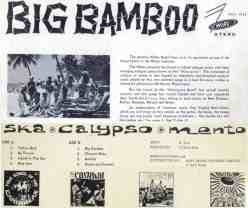 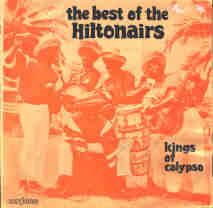 In 2001, I found a CD version of this 1966 release in Manley airport in Kingston. 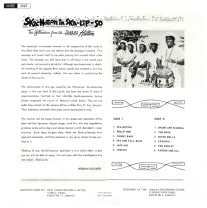 Not surprisingly, the CD has better sound quality than my old LP. 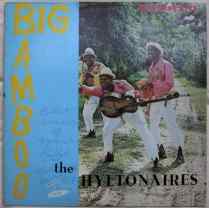 As middle period LPs go, this one is fairly easy to find inexpensively at used-record stores, on-line dealers and on eBay. 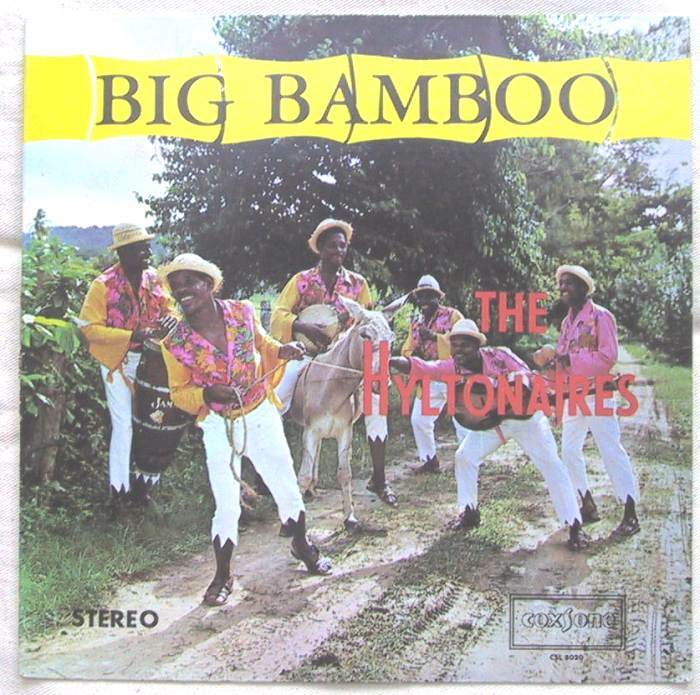 But which version will you wind up with? 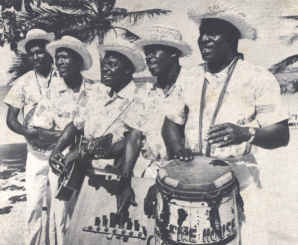 at Manley Airport in Kingston. version of the LP on the Coxsone label. 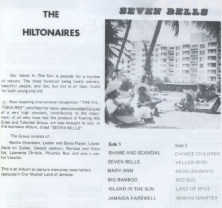 It has the 12 tracks found on the CD, but substitutes "Seven Bells" for "My Pussin'". 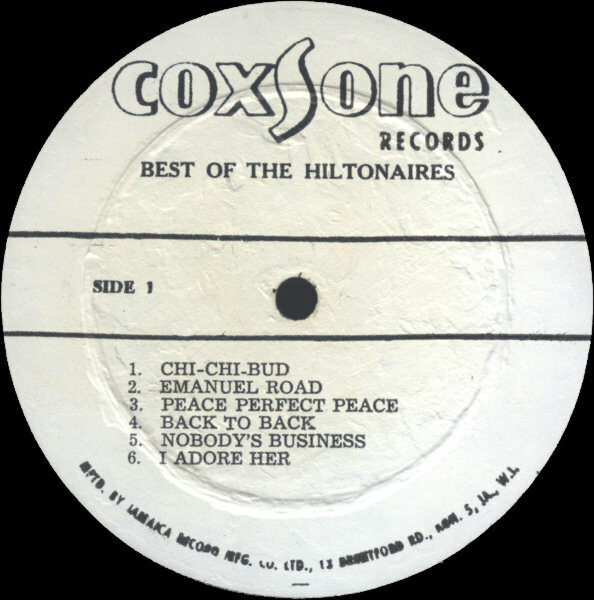 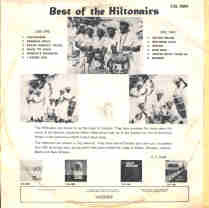 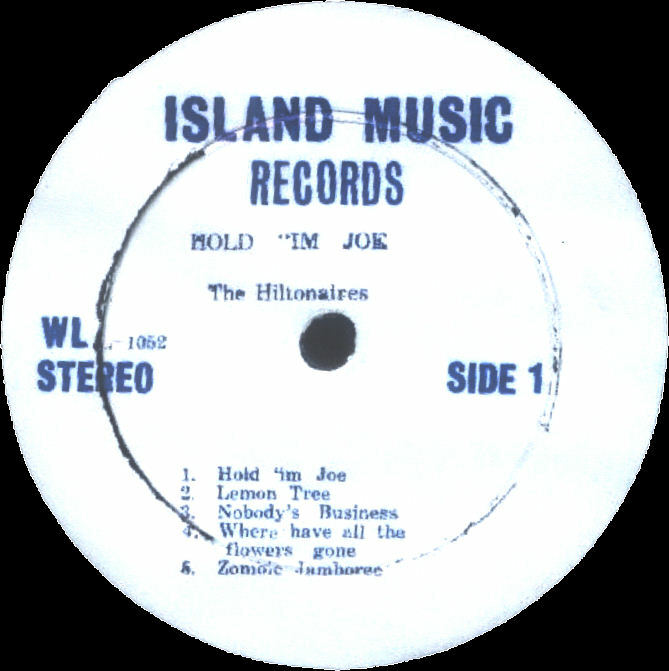 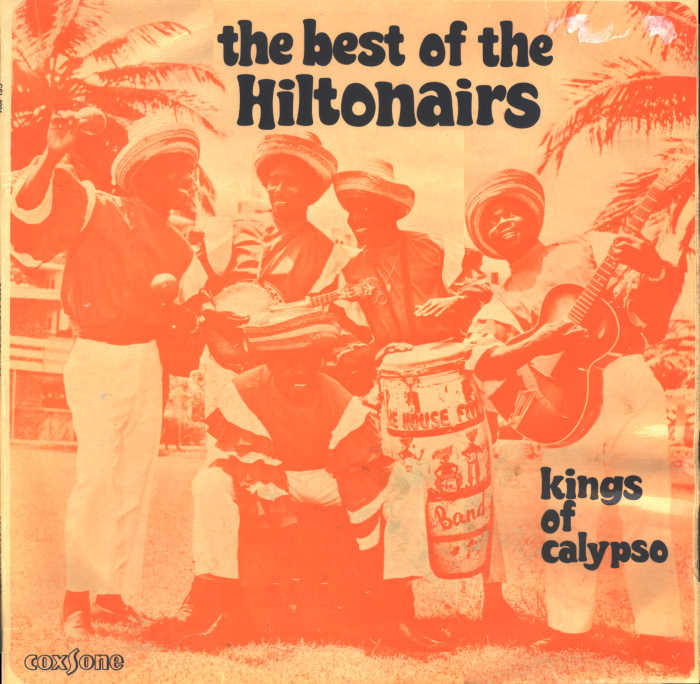 "The Best Of The Hiltonaires", on the Coxsone label, is not a collection of tracks from their other LPs, but a new set of tracks. 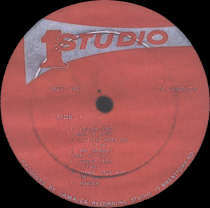 It includes "Nobody's Business" and "Archie", both of which were covered by Peter Tosh, as discussed on the Wailers page. 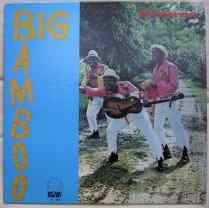 Also included is a cover of Toots And The Maytals "Bam Bam", with the addition of trap drums and organ to the rural instruments. 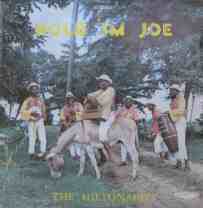 Check out the little banjo-ukulele on the front cover! 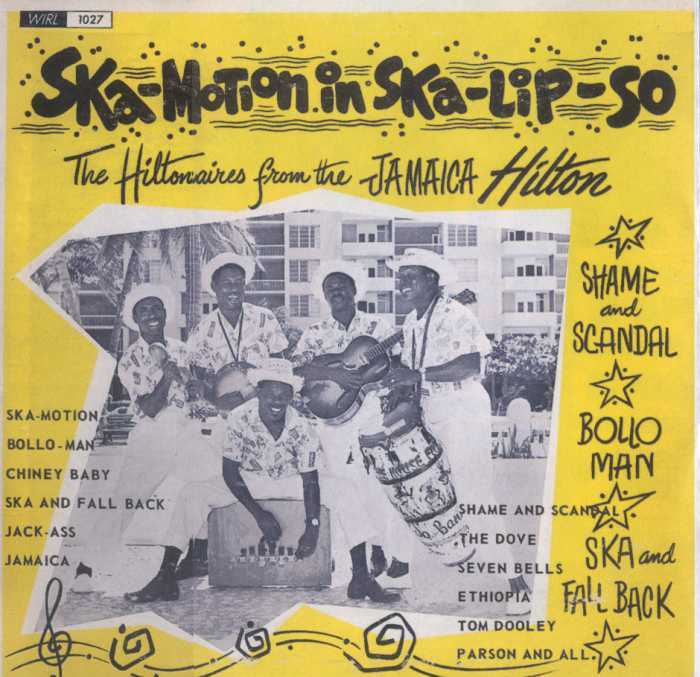 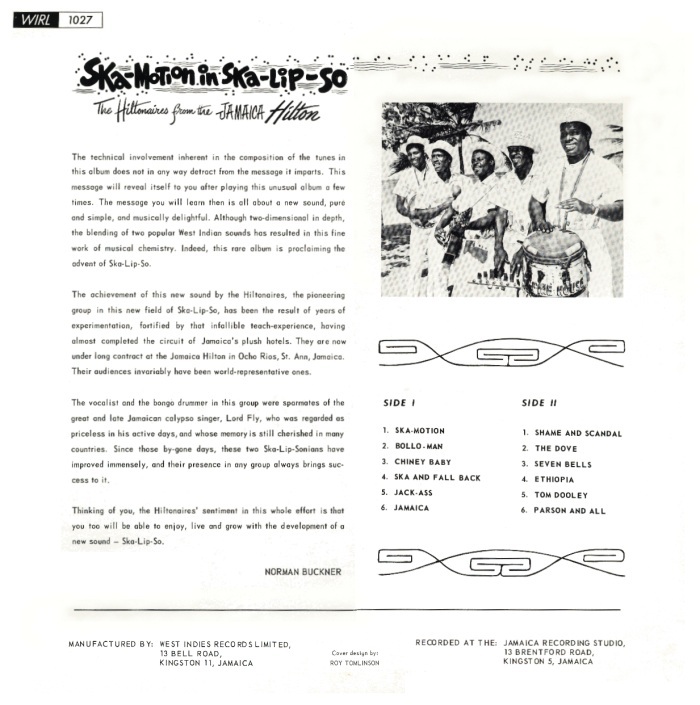 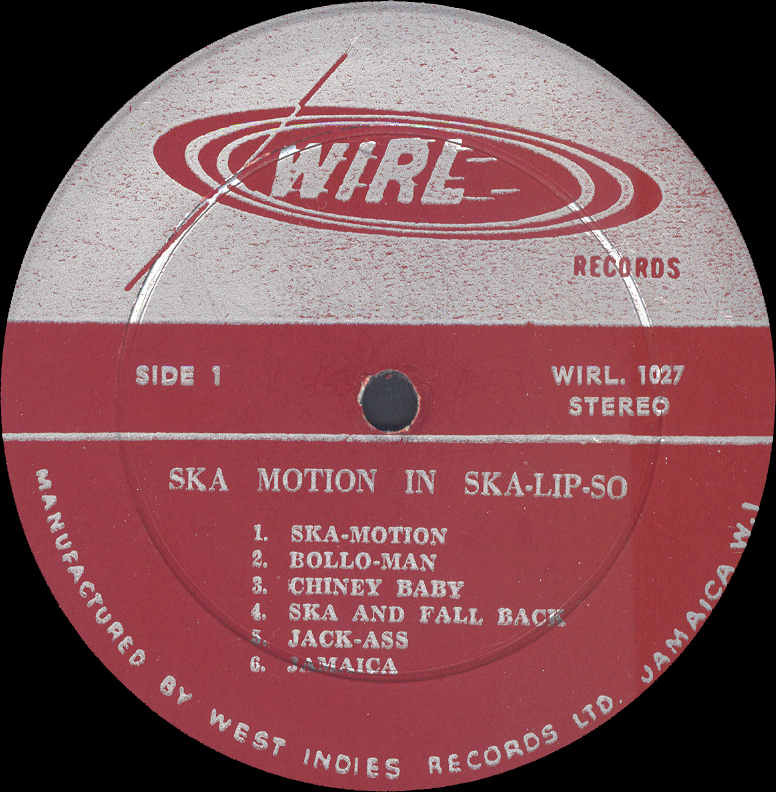 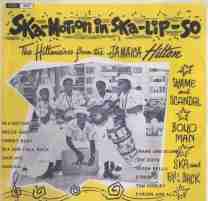 Courtesy of Dan Neely, Steve Brentford and Matthias Münchow, respectively, the front, back and label scans of The Hiltonaires' LP, "Ska-Motion In Ska-Lip-So". 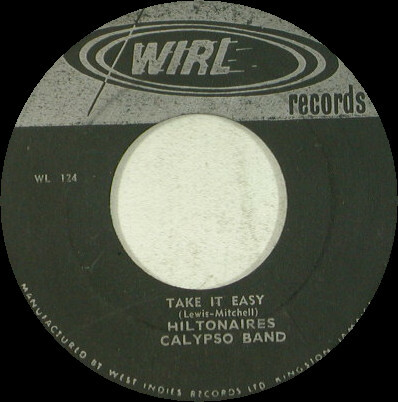 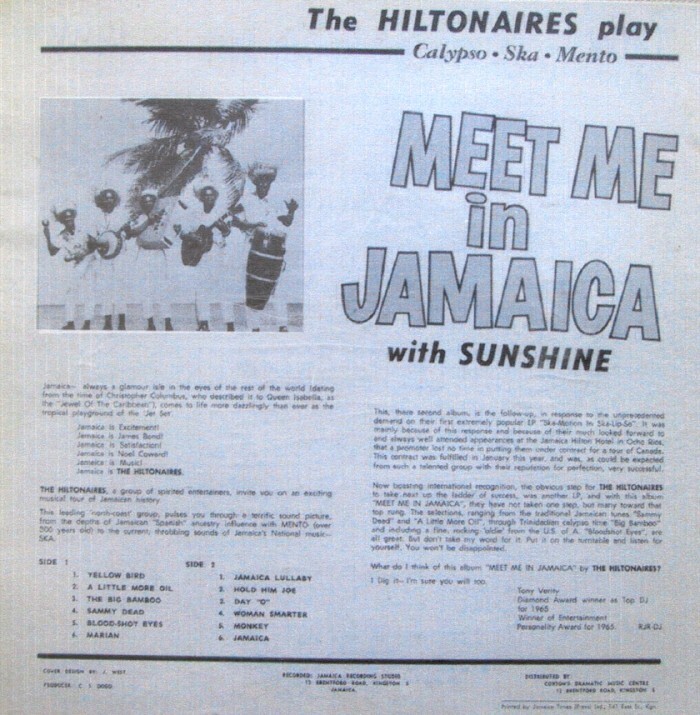 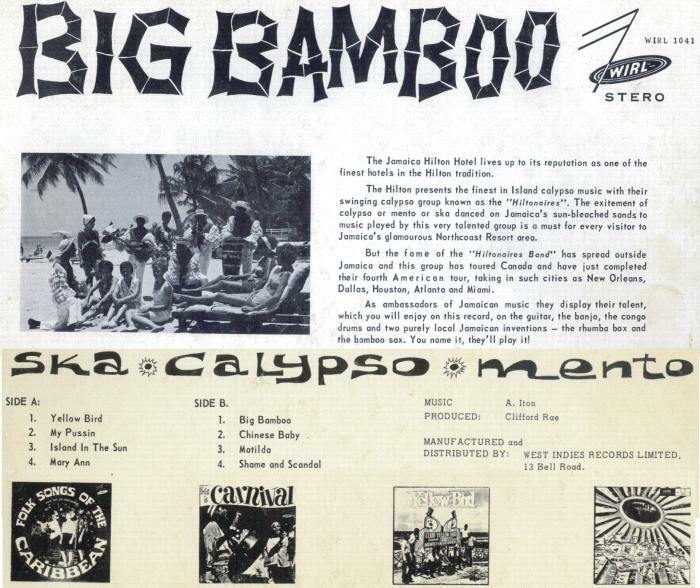 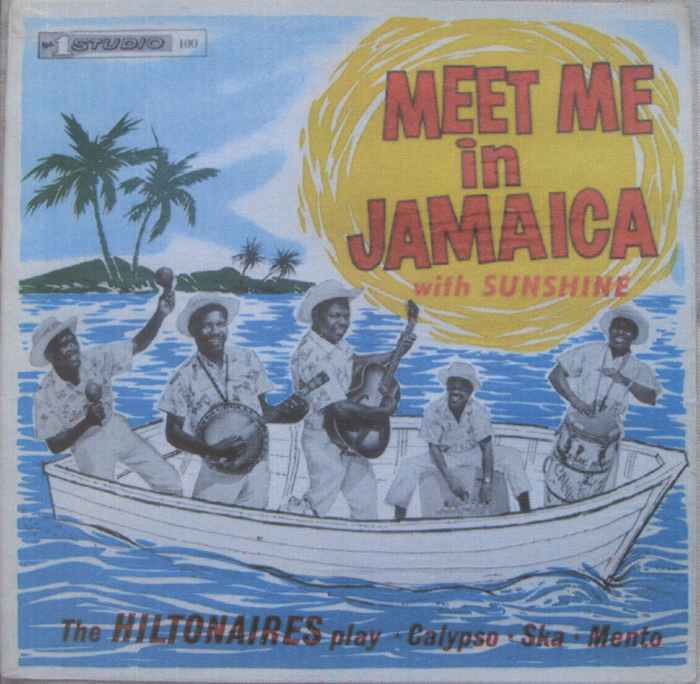 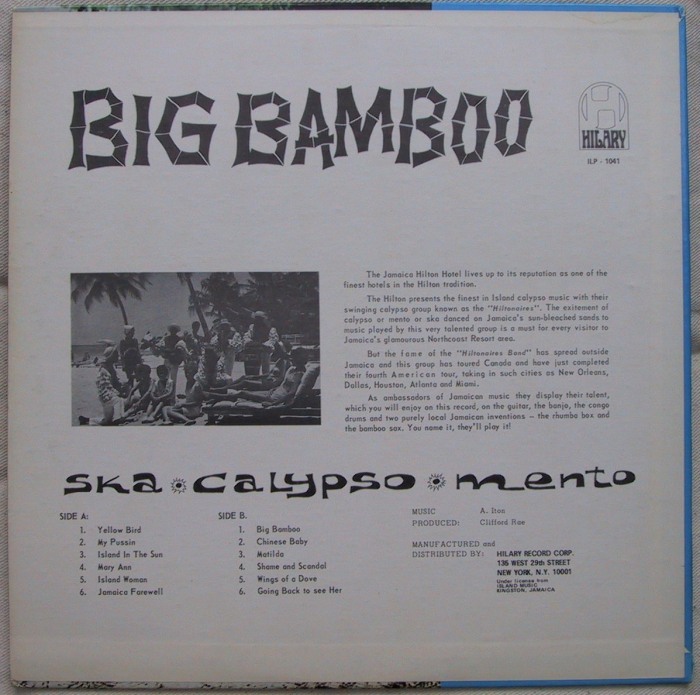 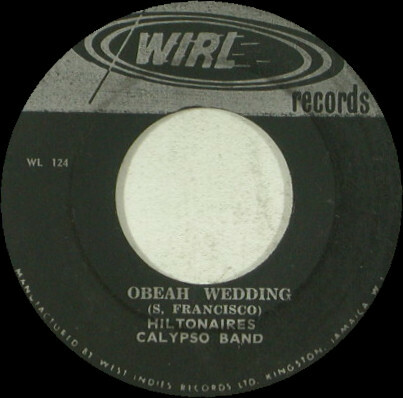 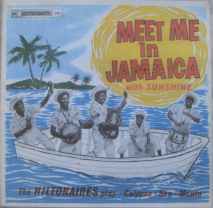 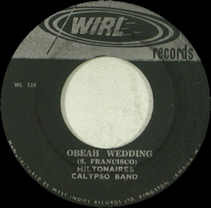 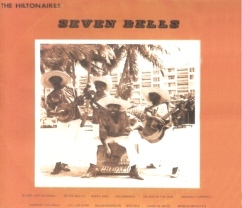 Like its sequel, "Meet Me In Jamaica With Sunshine", this LP adds an electric guitar ska chop to some tracks, but the music is really still mento in both instrumentation and repertoire (even if the word "Ska" is worked into some of the titles of familiar mento songs, like "Ska and Fall Back" instead of "Dip and Fall Back"). 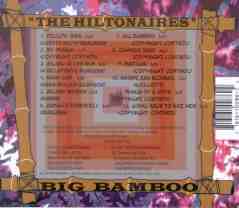 This LP came back in print (on vinyl, not CD) in 2003. 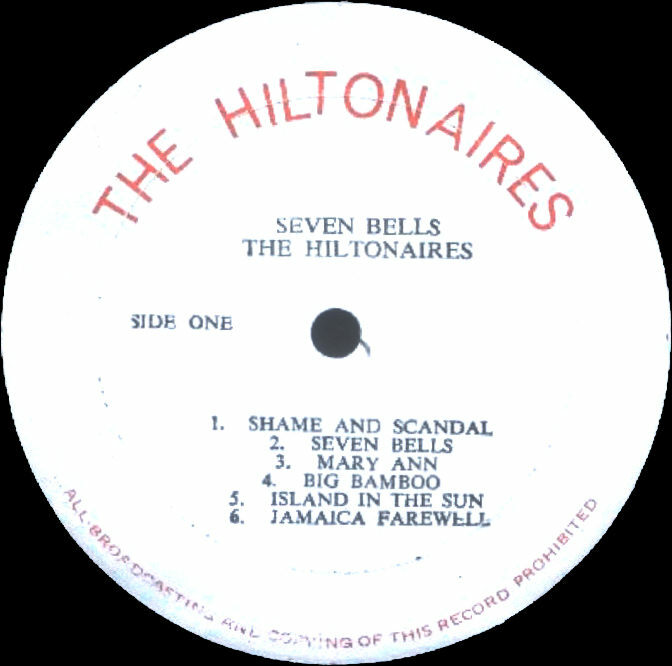 Yet again, courtesy of Steve Brentford, here are three more Hiltonaires LPs. 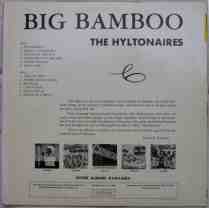 These are a little harder to find than Big Bamboo, but as mento records go, not very difficult or expensive to acquire. 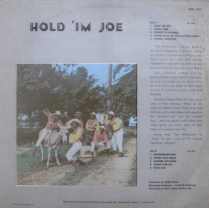 A similar sound to the Big Bamboo LP described above, but Hold 'Im Joe features covers of several American folk-pop songs in addition to songs from the mento repertoire. 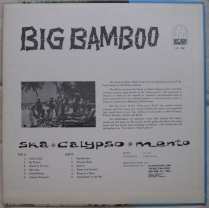 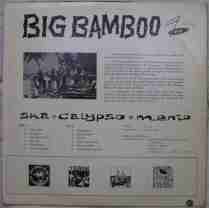 "Big Bamboo" and "Day O". 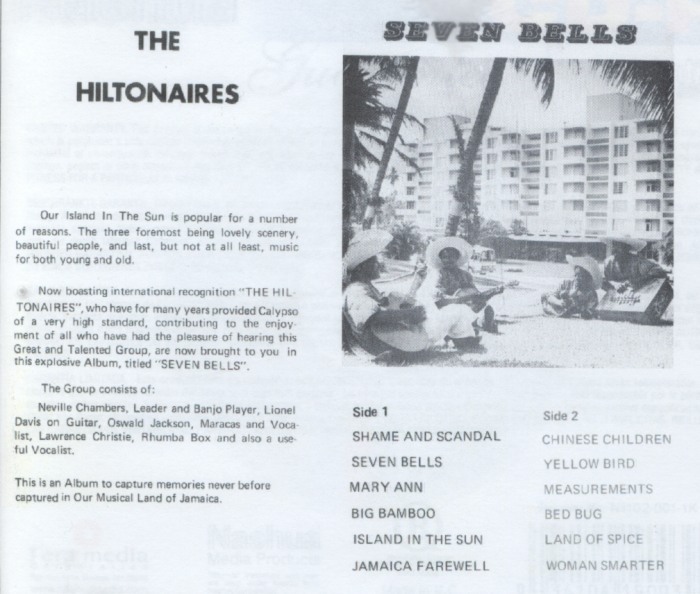 This is a surprise, but not a shock, as Dan Neely has already documented that The Hiltonaires provided instrumental backing on some of Tanamo's mento recordings, as mentioned on the Lord Tanamo page.